We are having problems with the repeatable quest. People are finishing it five times, and the quest disappears after collection, but it is only showing as three or four times on the leaderboard. Another person had it vanish after three completions when he went to collect it. 2.5 Million to get the rune? Who came up with that number? Are they trying to make the whole thing fell hopeless to the entire guild from the beginning? I get having a challenge but if only the 10 guilds can get the rune ... that does not feel like a fun event at all. Last time the amount needed for the rune was 1/3rd of what it is this time. Here's a question about the Igorok changes and maybe it's just bad luck or poor observation but I haven't seen a single Epic activation since the event started and I've been using him a ton. Anyone else notice this or definitely notice his epic triggering? Am I the only one having problems 3 starring the second Dungeon? Admittedly I'm cheesing it with Solaris and Leo but everyone is alive(Solaris as well since I know her reviving from her ability just as a dungeon ends doesn't count) at the end and it should count but for whatever reason it isn't, any ideas? The epic doesn't trigger with his skin equipped. It's been a bug that's been around a long time. Hopper typically targets the fast samurai. koros can usually kill everything, but don't use flames on the fire guys. igo can tackle the fire guys. marrow... is just there. There are event passives. You can swap him for solaris or any other healer/ rezzer. No, this is newly introduced. I use him auto-running Lava Academy and I've been getting epic triggers with his skin equipped for a while. This is a new bug introduced with the re-work. I definitely have gotten Epic triggers with his skin equipped before so that's not it. Is he getting epic triggers when the skin is not equipped now? Yes. This is a new bug introduced with the rework. 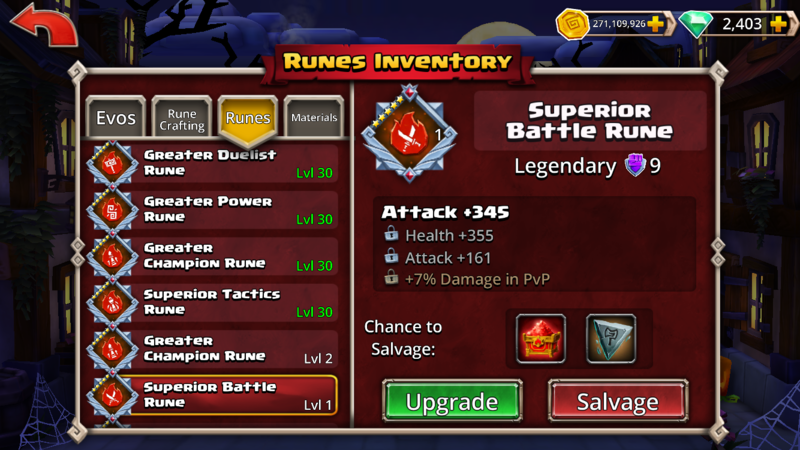 Has anyone had any runes from break the vault dungeon? I’ve done it about a dozen times and get the same loot every time. Does his epic currently being broken have any impact on his epic bonus stats, or is it just the epic ability? When I heard that, I switched to his normal skin and the epic started triggering. Anyone who has his ice skin should switch. Igorok skin off is 8027. Put it on and 7238. So more than just affecting his epic. I must say that's it's really nice to get some challenging PvE dungeons again. I mean... Dungeon Boss. Aah, there! Got it the third time. Which I unfortunately can't say for the development team of this game, who seem to develop this game by dragging each others **** across old dell keyboards. And who are so amazing at common sense balance, it makes one wonder how they walk into work on 2 legs. Thank you for the most fun event you have given us, "**** you if you don't have igorok, koros and hopper", as you decided to bless us with this theme this occasion. Let me express my gratitude by never supporting you, and continuing to use your bandwidth by playing for free. But you win, you have lured about 50 bucks out of me over the course of 1.5 years. Which I hope you spent wisely, unlike I have. You have done your fair share of nerfs on players fun up until now, and with this I join the side which vow to never support you ever again. I do not understand at all what you are trying to communicate. I think he missed the memo about "how to write an angry response that makes you look silly" in highschool. Caps over Bold man. Everytime. Edit: Someone who "agreed" with the completely abusive post that will be removed by Joel the moment he sees it got angry and decided to throw a little flag tantrum. Well at least his username is accurate. As far as the rest of the post... yea, I don't get it. Obviously he's upset, but I don't believe I agree. $99 for 250 tokens.. well it's optional, my 2* Marrow works perfectly fine for me. And I haven't spent any money on this event. Sure, more stars on Marrow gives your guild more points, but I highly doubt you need a 6* Marrow to hit the 2.5 million mark if you have a coordinated guild effort. If anyone has an alt stay at lvl 30 months or more and bring it to legend 1 every week, then this event will be like doing the kang kung in normal mode at lvl 70. It's my first time reaching lvl 39 in this game and it's by no means cash grab or pay to win at this point and I liked the invisible solaris. Keep it up devs. When are we going to get the Monster Guard Boost? Is the defensive boost operational? All we got was an empty email from Thalia, and guildies are reporting that the defensive boost seems to not be there for them. @Joel The people reporting that it feels like there is no boost are good players who would be able to tell. Edited: We got it now. If I type in all bold people will take me more seriously. Lol. You’re playing a freemium game from the App Store. If you want a game where you don’t have to pay to win, go play Heroes of the Storm or League or something. Games where you’re only playing for cosmetic bonuses. This game isn’t supposed to be fair or balanced and it never will be, so long as the devs need to make money (hint: that’s forever). Yep, same with our guild - Monster Guard boost is missing and I just verified we qualified for it. NVM - Just arrived. Next Time have Thalia use FedEx instead of the USPS.